After the tragedy of Saturday night, I thought that we might need to cheer ourselves up with thoughts of other little goaties. Not sure that I have introduced you to Husky, now I come to think of it! Husky is a Ginger goat in the making. She refuses to stay in her pen and clambers out through the bars, just like Ginger. Her sister, Wolfie, fortunately does not follow her naughty sister's example. She spends most of her day just trotting around the barn, eating hay out of whichever hay rack happens to take her fancy. And, of course, she is always there to help the humans with anything - she is especially useful when it comes to feeding time. 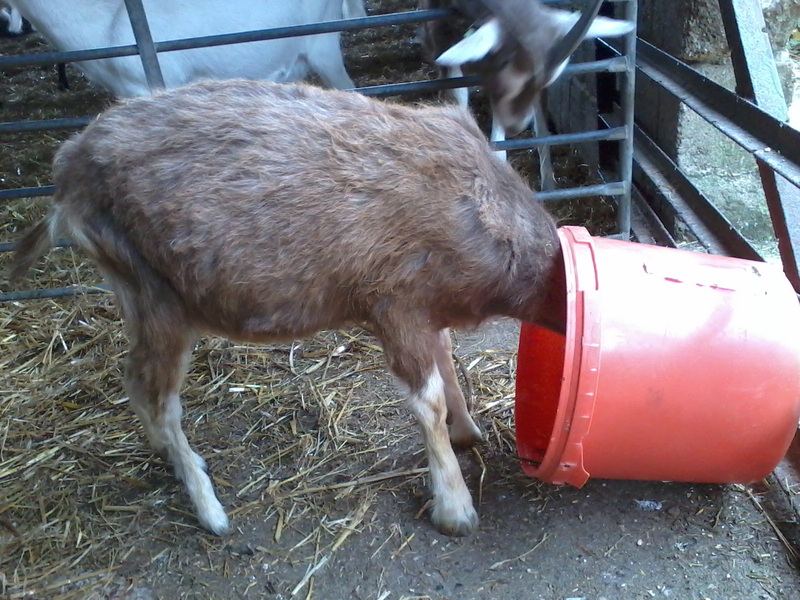 She is a sweet little goat and, despite her naughtiness, is actually rather well-behaved. Like a small dog, she just follows you around and trots from shed to shed behind you! And talking of little goats .... I did a little foot-trimming with some of the goatlings today and decided that Fizzy should be one of my victims. It did make me chuckle though as she has such tiny little feet. It was quite back-breaking trying to get down to her level! I had some food in a bucket to keep them occupied .. look at the size of the bucket compared to little Fizzy .. She is such a tiny person! Big personality though ..